Earlier in July, we learned that MoDOT earned top honors in the Mid-America Regional “America’s Transportation Awards” competition for two projects. The first, kcICON, won as the large project in the "Ahead of Schedule" category. 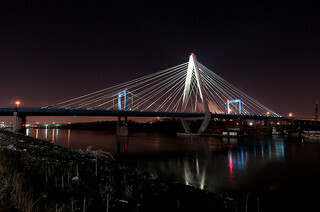 In addition to widening about five miles of Interstate 29/35 and rebuilding five interchanges, the Kansas City project included the new signature cable-stayed Christopher S. Bond Bridge across the Missouri River. Construction began in April 2008 and – even with all of that work – was completed in December 2010, more than six months ahead of schedule. 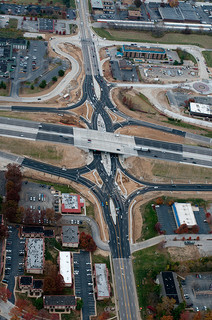 On the other side of Missouri, the St. Louis area’s I-270 Dorsett-Page Project won as the medium project in the “Under Budget” category. Three projects were rolled into one, giant, congestion-relieving undertaking. It was completed for $2.4 million less than the original $34.8 million budget – and was opened a month ahead of time to boot! How does this happen? MoDOT and its contracting partners pay very close attention to detail and work as partners through the design and construction phases. Communities also deserve credit for providing feedback during planning stages and for motorists’ patience and attentive driving during construction. Working together, MoDOT, contractors and the people of Missouri are able to obtain maximum value from limited transportation dollars. How do we compare to other states? We’ll get some indication in November when these winning projects compete with those from other regions for national honors at the American Association of State Highway and Transportation Officials’ annual meeting. There’s likely to be a People’s Choice component to the competition, so look for your chance to vote soon!